SABU Looks Back at Eventful Black History Month In February and early March, performances, panel discussions, film screenings and lectures put the focus on black history and the black experience at Washington and Lee. On a Sunday afternoon in late February, W&L’s Stackhouse Theater played host to seven “guests” with extraordinary stories to tell. From America’s first black Army nurse, Susie Taylor, to political activist Angela Davis, the characters who crossed the stage were all African-American women who made a major mark on history, even if their names do not appear in most textbooks. The spoken-word performance, “Hidden Black Girl Magic: A Tribute to African-American Women,” was the brainchild of Sasha Edwards, a first-year student from Mississippi. During a meeting of the Student Association for Black Unity (SABU) in January, Edwards tossed out the idea as one way to celebrate Black History Month on campus. Edwards wrote the short play and asked seven friends to dress up and portray the characters. She served as the narrator, introducing each woman as she appeared on stage for a five-minute monologue about her life and work. 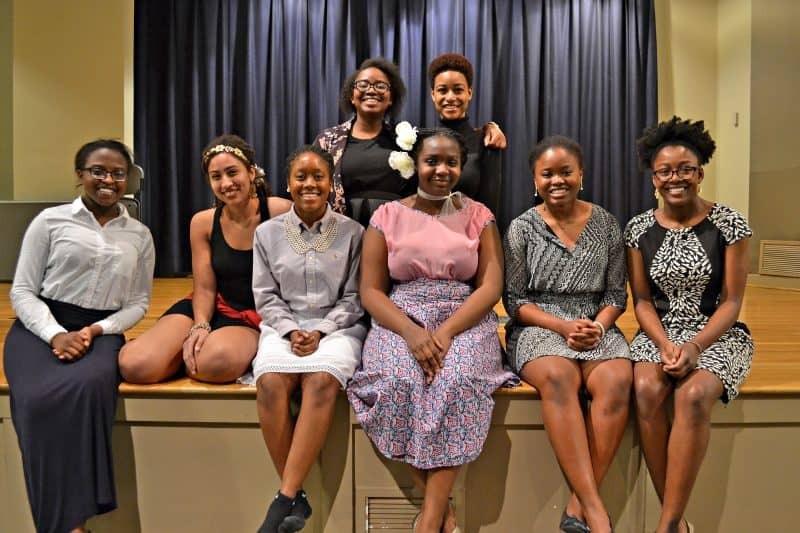 The “time machine” produced the following characters: Susie Taylor (portrayed by Cloy Onyango ’20), Josephine Baker (Baridapdoo Wiwuga ‘20), Daisy Bates (Alexus McGriff ‘18), Billie Holiday (Ramonah Gibson ’20), Fannie Lou Hamer (Joelle Simeu ’20), Shirley Chisolm (Elizabeth Mugo ’19) and Angela Davis (Demoriya Phillips ’19). Edwards, who acted in plays and worked behind the scenes in theater during high school, was both excited and nervous to pull off her first event as a W&L student. “I feel like I’d be determined enough to do this at any school, but it wouldn’t be as easy as it is here,” she said. Student Affairs staff members and work study students pitched in to help, so the play was ultimately enhanced by photos projected on a screen behind the characters – not to mention a time-warp graphic and sound effect in between characters. Billie Holiday was even able to “sing” one of her tunes on stage. “Hidden Black Girl Magic” was just one of several events on campus in February and early March that celebrated Black History Month. SABU co-leaders Truth Iyiewuare ’18 and Elizabeth Mugo ’19 said many of those ideas sprang from the same SABU brainstorming meeting, and this year saw more involvement than in years past. They suspect that better planning and marketing, as well as the current political climate, contributed to greater participation. On Feb. 12, in response to an idea from Ramonah Gibson ’20, SABU and the African Society hosted a discussion about black hair at Hillel House. The purpose of the event was to address people’s curiosity about black hair with demonstrations, presentations and conversations. It included a 13-person panel made up of men and women with different hairstyles. As a result, the multipurpose room at Hillel was packed with students of all ages, races and backgrounds. Several stations were set up around the room, and guests rotated through the stations to talk about different black hairstyles. At each station, a W&L student modeled the featured style. The hosts also invited a guest black hairstylist from Roanoke. “Even the black students on campus learned things they didn’t know,” Gibson said. Other Black History Month events at W&L included a Black Poetry Night, when everyone was invited to the Commons Living Room to read a favorite selection by a black poet. The films “Moonlight” and “Loving” were both screened, and the university hosted two lectures. In early March, a Black Lives Matter panel discussion drew a large crowd and lively discussion. After the annual John Chavis Lecture in African-American Studies, Greek and Residential Life Coordinator Chris Moore hosted a Chavis House program focused on chicken and waffles, an iconic (and delicious) food combination that traces its roots back to the Harlem Renaissance. Associate Dean of Students and Dean of Juniors Tammi Simpson, who is also the advisor for SABU, said student involvement this year made for one of the most eventful and successful Black History Month celebrations she has seen at W&L.